Ohio native Cody Garbrandt (right) suffered a first-round TKO loss to T.J. Dillashaw in the main event of UFC 227 at Staples Center in Los Angeles, California. Ohio native Cody Garbrandt suffered a first-round TKO loss to T.J. Dillashaw in the main event of UFC 227 at Staples Center in Los Angeles, California. The summer of 2018 has been a rough one for Ohio fighters inside the Ultimate Fighting Championship’s Octagon. Less than a month after Stipe Miocic dropped the UFC heavyweight championship to Daniel Cormier, former UFC bantamweight champion Cody Garbrandt came up short in his opportunity to regain the title and suffered a second straight loss to T.J. Dillashaw in the main event of UFC 227 at Staples Center in Los Angeles, California. Garbrandt started the fight by seizing control of the center of The Octagon and was mixing in many more leg kicks than his first encounter with Dillashaw. Although able to land in flurries, one of which created a huge swell under Dillashaw’s right eye, Garbrandt took damage in those exchanges and got dazed twice. The first time, Garbrandt was able to fight back to his feet despite taking nearly a dozen right-handed punches to the head. However, the second time around, Dillashaw never relented. After landing a right-handed punch to Garbrandt’s jaw, Dillashaw swarmed, landing more than 20 strikes with the right hand and a vicious knee to the head. While still standing against the side of the cage, Garbrandt absorbed four more punches before referee Herb Dean called a stop to the bout with 46 seconds remaining in the first round of the scheduled five-round, 25-minute contest. A native of Uhrichsville, Ohio, Garbrandt dropped to 11-2 in his professional career, with both of those losses coming against Dillashaw, his former teammate with the Team Alpha Male Gym in Sacramento, California. Prior to the losses to Dillashaw, Garbrandt rattled off 11 straight victories in professional mixed martial arts bouts. 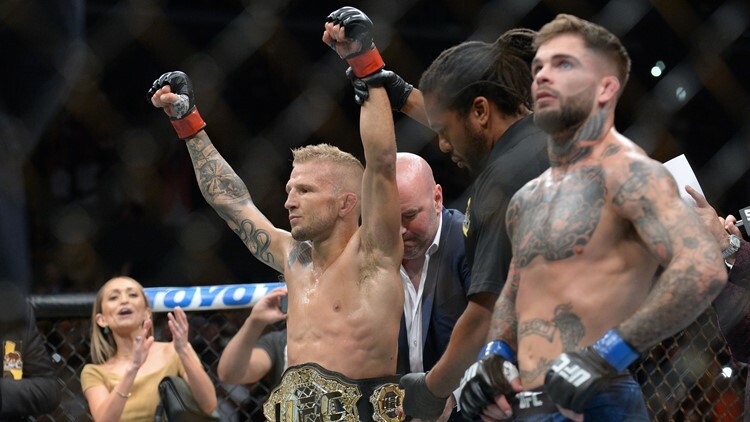 Dillashaw improved to 17-3-0 in his MMA career and successfully defended the UFC bantamweight championship with the second straight finish over Garbrandt.